It’s been a while since our last post. We’ve been busy cooking up some very interesting plans for 2019 but just to remind you all we are still out our here doing our thing, we are going to take a look back at our two pop-ups we had at Riis last summer. On two very steamy Saturdays in July 2018 we set up our shop on the boardwalk. As always Riis was packed. We even had a Cynthia Nixon siting while she was out their campaigning! We met a lot of amazing locals but also some people from all over the world. They were two magical book selling days we still havent forgotten, and help us to keep warm on these cold Janaury days. Stay tuned, big news coming about our 2019 events. We look forward to reading with you again soon! Winter and spring have flown by and we have been hard at work! In February, March, and May we held three more pop-up shops at Rockaway Brewing Company at the Beach. Each with a unique theme and partnership, and all full of activities and reading. In February we paired up with the Black Surfing Association of Rockaway (BSA) to bring a little bit of summer to our winter blues. Louis Harris and the kids he teaches stopped in to give surf demos, then Rachel Krieger did group yoga with them. Check out the pics below to get a taste of what the day was like. We gave back to BSA by continuing our trend to donate 10% of our proceeds from the day to a local non-profit. We can’t wait to hang out with these guys again. May’s pop-up saw the last of our "winter residency" pop-ups at the Brewery, and we went out with a bang. It was a beautiful day, Cinco de Mayo, and the bar was full. 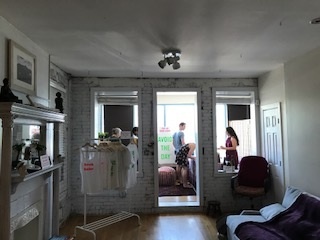 We met tons of local visitors, made some new friends, and at this pop-up donated a portion of our proceeds to the Ladies of Business Rockaway Beach. In celebration of this collaboration we hosted a live screen printing of the word “Feminist,” on tees and totes. Special thanks to the RAA Print Shop for bringing their mobile print shop. Who doesn’t love being able to make, and then wear, their own art? Our residency is over for now, but we loved hanging out with all the cool people who came to the bar to read, buy books, or just chat. We are very grateful to the Rockaway Brewing Company at the Beach for hosting us and hope to be back soon! What a year it's been! We have popped up 7 times all over the Rockaway Peninsula since we began in July. 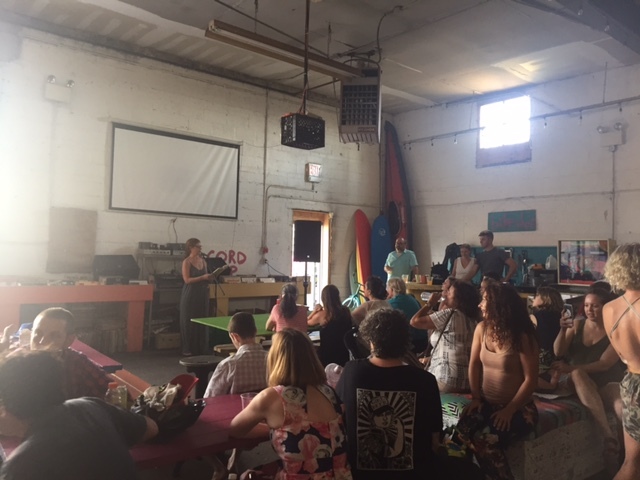 NurtureUWellness was our first stop, then the Rockaway Artist Alliance for WordWaves, on to the Rockaway Brewing Company at the Beach, followed by CROM during Rock-a-Block, a serene day at Rockaway Love, and then back to the Brewery for the last two of the year. It has been an amazing journey, thank you for joining us on it! Your support and enthusiasm has helped us improve and grow and we have no plans of stopping. Remember, you can find us the first Saturday of every month January-May at Rockaway Brewing Company at the Beach. We are planning some amazing events and collaborations in 2018, we cant wait to see you there! 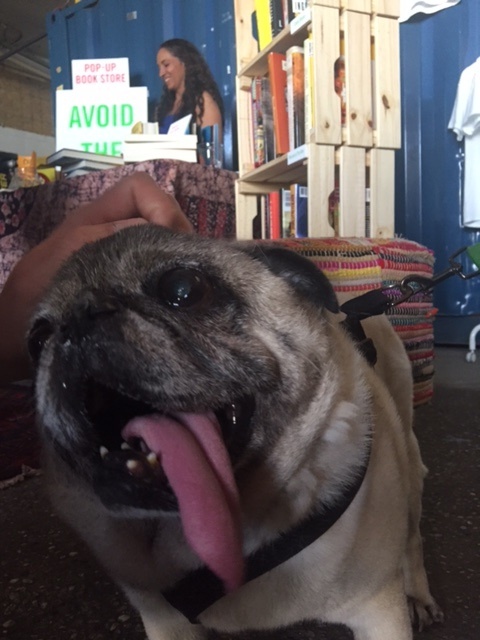 Avoid The Day had the joyful experience of spending this past Sunday at Rockaway Love yoga studio. Just being in this gorgeous space makes you feel more relaxed and open to new possibilities. We had an array of healthy snacks set up, as well as espresso and water on hand for anyone who needed some libations throughout the day. 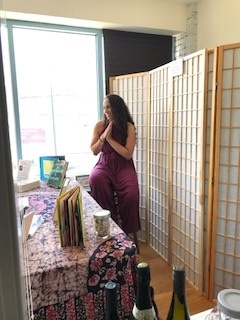 The day's activities included a yoga for creativity class taught by Rosa Stychek, therapeutic coloring, and a children's reading put on by Rachel Krieger. The people who came out of Rosa's class looked so excited and rejuvenated! It was amazing to see how a two hour workshop can shift people's energy. The bookshop was bustling with many new customers. It was great chatting with other book lovers and watching people find new treasures to take home with them. If you haven't been to Rockaway Love for a class-go! It truly is an amazing place with awesome instructors full of positive energy. Saturday September 23, 2017 was a gorgeous beach day in Rockaway. Unseasonably warm, stellar waves, and a fun filled street party that Avoid The Day was lucky enough to participate in. The Rockaway Business Alliance organized Rock-A-Block Blvd along Rockaway Blvd between Beach 89th and Beach 94th streets. Represented at this fest were a ton of awesome local businesses. Avoid The Day Bookstore Pop-Up was set up inside CROM Physical Culture's space, but we also had a therapeutic coloring table set up on the street all day that got A LOT of love. Sarah and Chris Romulo were gracious hosts and the Pop-Up's aesthetic got a serious coolness upgrade being set up in their fantastic gym. We had a lot of interested out-of-towners who came in for the weather and the block party. We also had the opportunity to hear Chris Romulo talk about his book "Champions Uprising" and inspire all of us to do more and put our heart into everything we attempt. Kids and Adults alike came out later that day to hear Marie Barret read from her book "Sandy Can't Get Me Down." As always we are happy to have been able to facilitate these local authors getting the word out about their books. The only regret we have is that we were too busy working to enjoy all the other fun activities at Rock-A-Block Blvd. But everyone has another chance to enjoy it on October 7th. We wont be there but if you come, you are bound to learn about yourself, eat amazing food, hear some kicking music, and find some treasures to bring home with you. Sunday was a beautiful beach day and Rockaway Brewing Company at the Beach was full of thirsty beach goers, locals, and a out-of-towners. Business was steady all day for Avoid the Day Bookstore and we came away with a good amount of money to donate to Rockaway Rising to help with their Summer Camp. We are over the moon for the kids who get to benefit from our 50% of the proceeds donation! Our first purchases of the day were made by Joaquin and Tiffany (RBCO staffers) before we even finished setting up. The brewery employees made the day so special for us with their welcoming, supportive, and easy going vibe. It was such a pleasure to share their work space. From 1:00 to 2:30 the music was jamming, drinks were flowing, and the book store was smiling. People browsed for beach reads, locals who heard about us on social media asked questions, and kids sifted through our children's books. The local author section was quite busy in anticipation of Jill Eisenstadt's reading that evening. At 2:30 Rachel Krieger lit up the book nook with glitter and her reading of "This Is Not My Hat." She had the kids enthralled wanting to hear more! From 3:30-4:30 there was therapeutic coloring time with beer (for adults). It was nice to see everyone so immersed. At 5pm, the local and acclaimed author of Swell, Jill Eisenstadt, read a steamy passage from her new novel. If you haven't picked one up you should. It was a spectacular day overall and we are so thankful to everyone who contributed their time, space, and energy and to the people who came out to support us. And special thanks to RBCO, Max Power, Tiffany, Shane, Joaquin, Sergio, David, Rosa, Kyle, Rachel, Jill, Abby, Wayne, Jess, and Leigh for their help throughout the day. Fort Tilden was on fire with creativity this past Friday night! Talented local (and not so local) artists, poets, storytellers, and musicians came out and shared their amazing work. 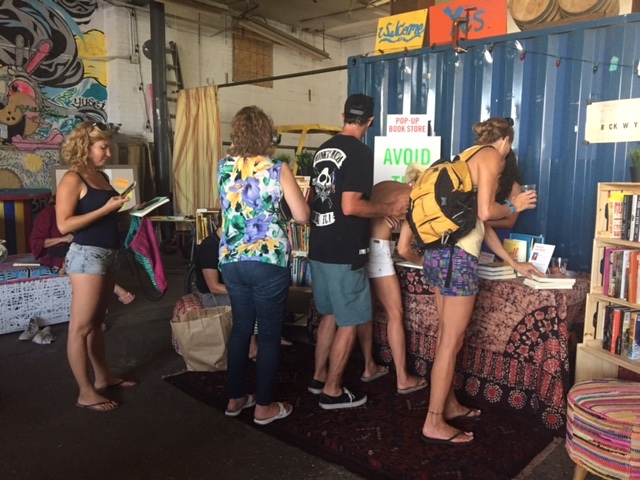 Victoria Barber, the organizer of WordWaves was kind enough to allow Avoid The Day Bookstore to pop-up during this event in Fort Tilden in the gorgeous Rockaway Artist Alliance studio space. It was a lovely night and ATD got a lot of interest and questions which we always encourage and welcome! Hope to see our friends from WordWaves as well as some new friendly faces at the next pop-up at Rockaway Brewing Company at the Beach on Sunday 8/13 1-7pm. 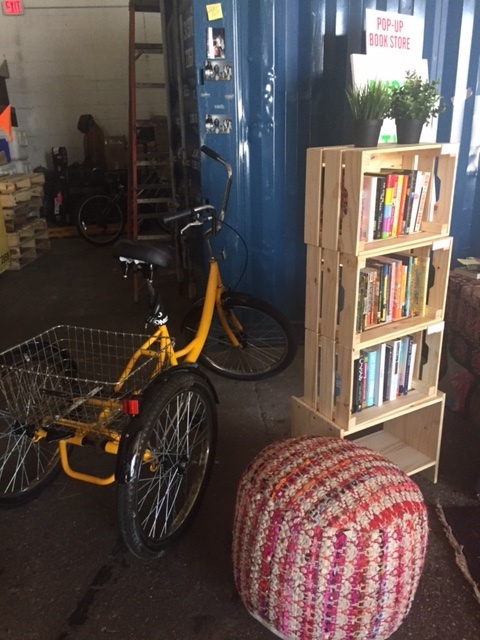 After months of collecting books, making signs, and gathering and assembling materials, Avoid The Day's first pop-up bookstore came to life on Sunday July 16, at NurtureU Wellness on Beach 116th Street. On Saturday we ran around completing last minute errands. Getting wine from Ship to Shore to display (special summer recommendations from owner Rashida Jackson), tokens from Sayra's to give out, and cash to make sure we had enough change for all of our customers. The setup took longer than expected but with help from Samantha Cintron, Ariel Creamer, and Jason Heuer it was assembled Saturday night by 8pm. Sunday morning the excitement was palpable! After a quick stop at Cuisine by Claudette's to pick up their generously donated cold brew coffee, we began laying out food and prepping delicious mint and orange ice water. 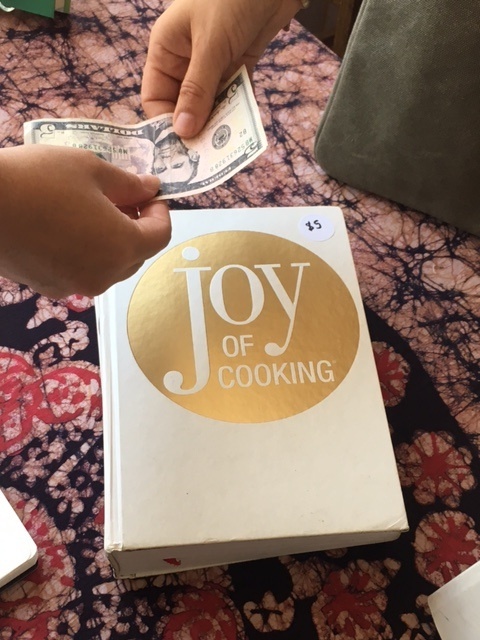 We opened our doors at noon and were greeted by the wonderful Anna Lev of Rockaway Love, who bought a much coveted edition of "The Joy of Cooking". With that, Avoid The Day had it's official first sale! The rest of the day was a blur of activity. We had locals and tourists coming in and out, chatting us up, coloring, and buying books and t-shirts. Gene Apodaca from NY1 stopped by at 3pm to survey the shop and interview us about the business and its first event. At 4:30 Ariel read to the children who were gathered and they seemed to love the silliness of "The Book with No Pictures" by B.J. Novak. It was an amazing day! We couldn't have asked for more and are so grateful to the people who came out to support us, and the businesses and authors who worked with us to make this happen. 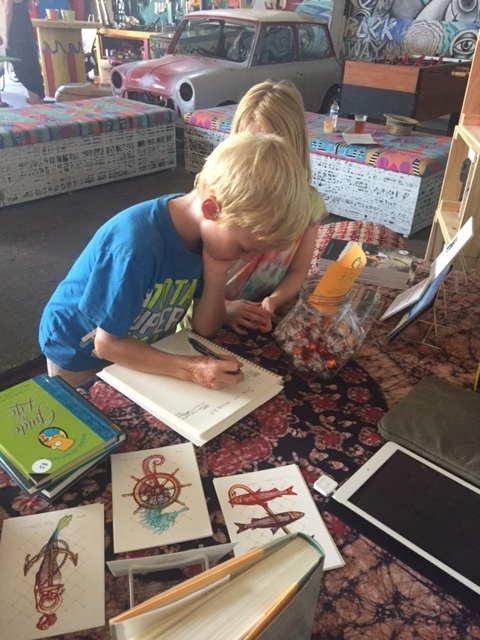 We hope to see you at our next pop-up at the RAA Wordwaves on August 4th! 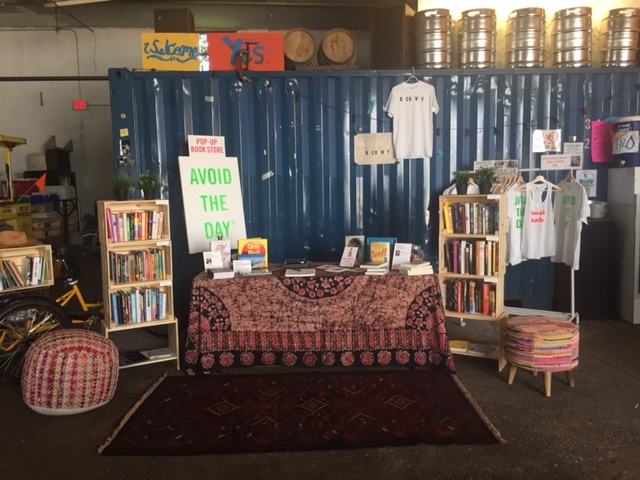 Avoid The Day Pop-Up Bookstore is Official!!! After months of work and contemplation I finally made it down to the courthouse in Queens to apply for my business certificate. On Monday June 12th 2017, a fellow Ladies of Business Rockaway Beach member (Rosa Stycheck) and I took the short drive from my home in Arverne to Jamaica, stopped by a tiny very hot deli and bought a form, checked our bags through the metal detectors and went to the office to make my pop-dreams come true. Rosa held my hand through the whole process, used her expertise to help me navigate the system, and took this celebratory picture of me afterwords, holding the paper that I need in order to start really getting to work. I can't thank her enough for all the support and help she has given over the last few months. Check back soon for updates on where and when our FIRST pop-up will be!